Next month Mika will turn 2. Sometimes we can't believe it either. The days are real long but the years are short. Being a mother is such a tough job, the hardest job ever. But you've brought so much joy to our family and friends, watching you grow. How's it going? :) Mom is quite tired of still waking up middle of the night to breastfeed you and even the masseuse complained that my dark circles are very very bad. Yes, you are now 23 months and still on breastmilk because you love it so much and it calms you down. You've grown to be such a fine toddler, but maybe getting a little bit more cheeky. When we sing song like C-O-C-O-N-U-T, you will say O-C-O-C on purpose to make us laugh. 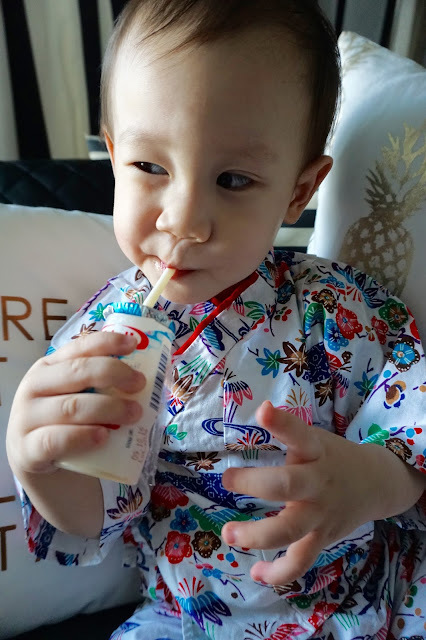 When MaMa said "NO MORE MaMa Milk", you will laugh and say NO MORE MOO MOO COW Milk and then we will laugh together. You are seriously so cheeky and MaMa loves you because of that. Actually, you are growing quite fast and you understand us pretty well! You can speak and understand what we said in such that MaMa, PaPa and NaiNai have to communicate in Bahasa Melayu or we would have to SPELLED it out when we want to converse privately in front of you. No joke. You kinda shocked us when you can sing ABC ( probably learn it from school or your favourite YouTube channel ) but whenever we ask are you to sing and put you on center stage, you froze and began to sing ABC D GGGGGG! and then you will laugh at us! but when you are playing alone with your toys, you could sing the whole song! How cheeky of you! Koko and I even taught you french but only words like : Maman and je T'aime because those are the most important key words. ( so bias ) Hehehehe... Do you know that Koko helps MaMa to take care of you whenever NaiNai goes to Singapore for long holidays to visit Candice? She likes to shower you and wash your poo poo! and more importantly, she loves you unconditionally and loves you more than she loves MaMa. You also like to simply point at people in the lift or anywhere and ask us " Who's that? " Quite embarrassing sometimes but it's all good as you and MaMa make more friends. During night time, you must listen to your christian songs and read at least 3 books before you go to bed. You love it when MaMa tickle your tiny toes and you will laugh and laugh and ask MaMa to do it again and again until you get tired. Then you will fall asleep while MaMa watches Modern Family beside you. I bet you know their voices in your head since we listen to them talk since you were a poppy seed growing inside MaMa's belly. MaMa can't wait till your birthday to celebrate with you! Time does fly when you are parenting.